When traveling to other countries w hat attracts visitors is cuisine. Northern Vietnam cuisine is known for its old, origin and unique. Visiting this place and enjoy the cuisine here will be an unforgettable memory for tourists. – Diversity: You’ll never get bored while enjoying Northern Vietnam cuisine because it has a lot of dishes and prepared and cooked in many different ways. – Less fat: If you do not like oily fatty food which is not good for health, Northern Vietnam cuisine is suitable for you. – Variety of flavors: Northern Vietnam cuisine is a combination between so many recipes and spices that make you enjoy your dishes. – Delicious and good for health: Ingredients in Northern Vietnam dishes are very fresh and delicious. It is a combination of vegetables and meat which increases the attractiveness for food as well as healthy for people who enjoy. – Use chopsticks to eat: Like many other Asian countries, Vietnamese people use chopsticks to enjoy many dishes. This is the very special and unique way to explore Vietnamese cuisine. – The community: Vietnamese people do not have meal alone. The meal of Vietnamese people is the get-together of friends, family or acquaintances. – Hospitality: Whether a family meal or a party, Vietnamese people always invite guest to stay and eat with them (whether people were invited or not invited). This represents hospitality and openness of the Vietnamese people. Having some general characteristics of Vietnamese cuisine, Northern Vietnam cuisine also includes of many specialities. Northern Vietnam cuisine usually does not taste too spicy, too sweet or too fatty as other areas. Northern people usually cook food with fish sauce or shrimp sauce. Besides, ingredients in Northern cuisine usually combine vegetables and seafood like shrimp, crab, fish and meats and common things like beef, pork, chicken. 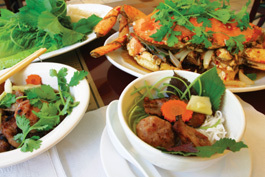 Northern Vietnam cuisine is prized for culinary development of Ha Noi cuisine. Hanoi Cuisine is famous for some typical dishes like Pho, Bun thang, Bun cha or snacks such as “Com”, “Banh cuon” and spices have long been famous. It’s natural that people were born in Hanoi in particular and the North in general leaving from far away always misses their hometown dishes. Northern cuisine is simple, full of nutrient; good for health and always an attractto travelers. One of the restaurants that I was recommended by a travel agent who organized a perfect one-day tour around Ha Noi (http://www.evivatour.com), where you can taste most of basic dishes is Ngon Restaurant, address 26 Tran Hung Dao, Hoan Kiem District Ha Noi.